Easy cycling with an electric bike from the historical center of Madrid right to the heart of our worldwide famous white football team: Real Madrid, and it’s Stadium, Santiago Bernabéu. Amazing tour inside the stands and in the players changing area! The tour starts in the historical center near the Plaza Mayor and rides down to Plaza de Cibeles - where all Real Madrid’s triumphs end - the players use to make a personal offer to the goddess Cibeles usually on the same day of their victory. From there, in Paseo de Recoletos we head straight up through that main avenue with three different names until we arrive to the stadium. It is called Paseo del Prado from Atocha Station to Cibeles Square, from there up to Columbus Square (Plaza de Colón) it is called Recoletos, and from there on Paseo de la Castellana. It is not the longest street in Madrid, but it can be the broadest, with its green boulevards on both sides. Plaza de Colón, or Columbus Square is a memorial to the Discovery, a 3m statue of Columbus rising 17m from the ground and a park “los Jardines del descubrimiento” with a underground theatre and the largest Spanish flag (294 square meters, more than 3000 square feet) in a pole 50 m high. 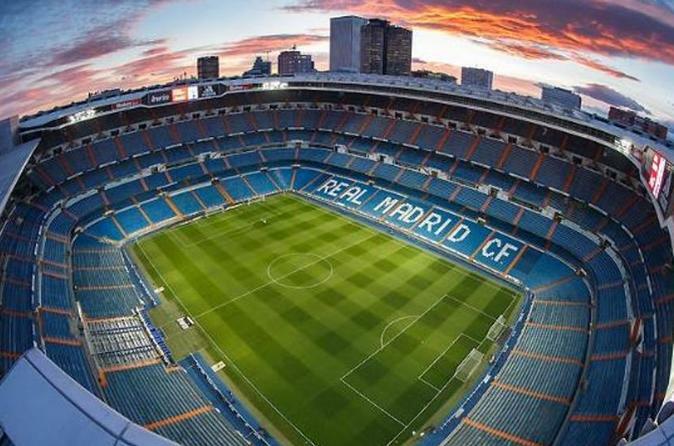 From here we still have a while to arrive to Santiago Bernabeu Stadium, a ride across the green boulevards and an open air Contemporary Art Museum, squares, the new ministries and up the business area called AZCA up to … Santiago Bernabeu Stadium!!! Inside you will be able to see the pitch, the stands, the grandstand, the players bench, their changing rooms and lockers with their names on; besides of their trophies, historical clothing, and the main biographies of their players and founders.